Being a Kerala girl and coming from a family with medicine & naturopathy connections, I grew up seeing various medicinal herbs and essential oils used in the making of a bunch of remedies that could be readily used for a variety of skin and hair problems. During my childhood, I always remember my mom bathing me after a long massage session using the ever famous coconut oil. Mom used to use everything from coconut. From making awesome cookies, wonderful Kerala cuisines and even the tender coconut water to make natural vinegar etc. My hair and skin always remained healthy until now. My hair is really thick and I never faced any hair related problems. Thanks to the wonderful coconut oil and also the genes. When I moved out of Kerala and eventually India, I felt the absence of my favorite skincare and haircare oil in the market. Everywhere I was seeing adulterated oil, or even filtered or refined or bleached oil that is good for nothing. I felt the lack of enough products in the market that are actually pure. When I particularly searched for Virgin Coconut Oil, I was not finding any good brands that gave the authenticity or came with ‘Absolutely No Heat’ Concept. I was particularly looking for a pure virgin coconut oil which is edible. Edible as in ‘can be consumed raw’. 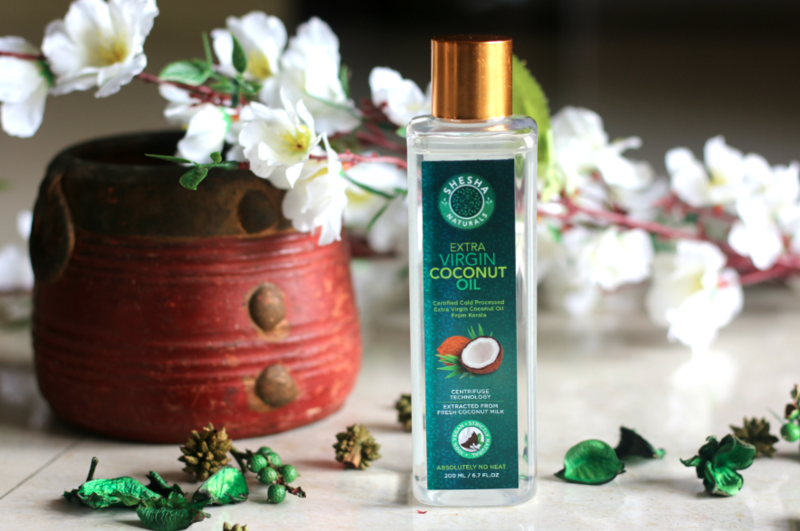 Through Shesha Beauty, coconut oil, without losing any of its benefits in the most purest – edible form of oil is presented to this world. Most people believe that Cold Pressed coconut oil is the best because, it is the most readily and commercially available VCO. Shesha Naturals now makes available, a grade of VCO so high that you can experience the full efficacy of its healing properties without worrying about quality and also in a shorter period of time. 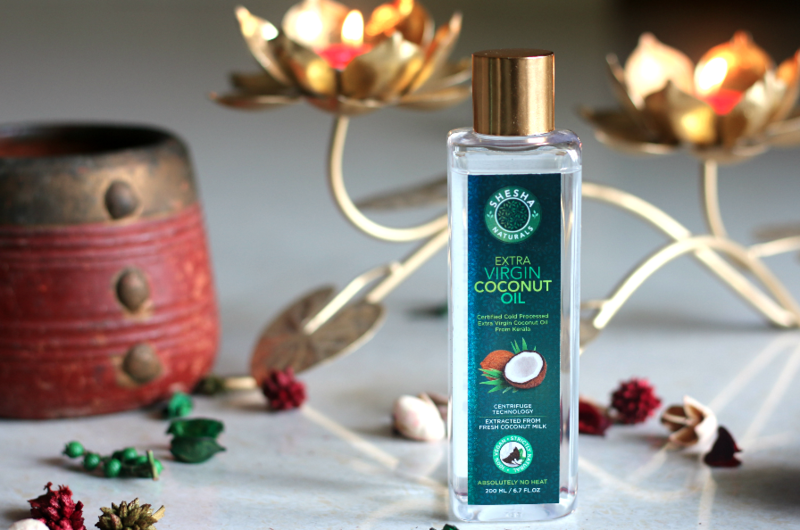 Before I even talk more about Shesha Naturals Extra Virgin Coconut Oil – I would like you all to understand more on what is a virgin coconut oil and what are it’s health care and cosmetic benefits and how is it important from a normal coconut oil. The main difference between regular coconut oil and virgin coconut oil lies in their processes of extraction. While the former is extracted by cold compression or cold milling of Copra (another name for dried Coconut kernels) with a moisture content of around six percent, the latter is extracted from the coconut milk obtained from fresh coconuts. 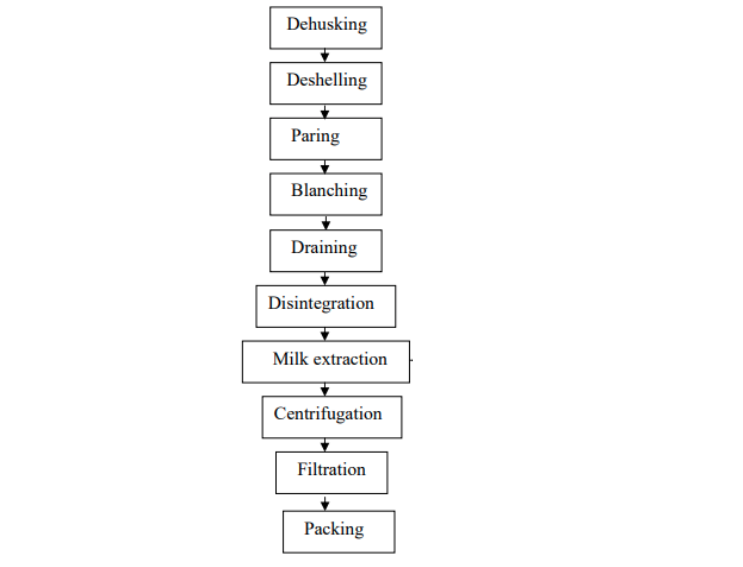 Thereafter, using processes such as fermentation, churning (centrifugal separation), refrigeration, and the action of enzymes, the oil is separated from the water or moisture. However, in the case of virgin coconut oil, the raw materials and the process of extraction should not allow any involvement of heat. 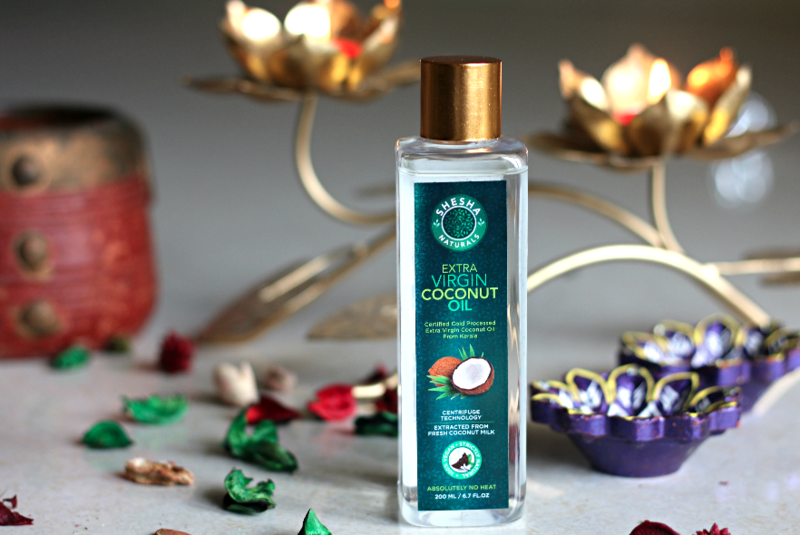 Shesha Naturals has taken utmost care about the manufacturing of virgin coconut oil, throughout the whole process, utmost care is taken to ensure that the kernels and the raw material, i.e. the coconut milk, are not subjected to heat or sunlight. WHAT IS VIRGIN COCONUT OIL ? HOW IS IT DIFFERENT FROM NORMAL COCONUT OILS ? Virgin Coconut Oil (VCO) is extracted from fresh coconut milk obtained from mature kernel of coconut by mechanical or natural means which does not lead to alteration of the nature of the oil. VCO can be consumed in its natural state without the need for further processing. Hence, VCO does not undergo chemical refining, bleaching or deodorizing. Virgin coconut oil is colorless, free of sediment and has natural fresh coconut scent. It is free from rancid odor or taste. Virgin coconut oil consists mainly of medium chain fatty acids. The fatty acids in virgin coconut oil are distinct from animal fats which mainly consist of long chain saturated fatty acids. Virgin coconut oil consists mainly of medium chain fatty acids. The most important medium chain fatty acid found in VCO is lauric acid. It constitutes 48 % of VCO. Lauric acid possess powerful anti-microbial properties capable of destroying disease causing bacteria, fungi, viruses and parasites. Researches show that the presence of medium chain fatty acids in mother’s milk is the primary ingredient that protects new born infants from infections for the first few months of their life, while their immune system is still developing. It is rich in lauric acid which protects your heart by reducing total cholesterol and increasing good cholesterol. VCO is the best skin care solution for babies. Perfect to be used as a baby massage oil. Free from all chemical formulations and assures good protection to the baby skin. Some of the features of Shesha Naturals Virgin Coconut Oil(VCO) is abundant in vitamins, minerals and anti- oxidants, thus making it the ’mother of all oils’. Shesha Naturals Cold Processed Extra VCO is extracted from fresh coconut milk without any chemical processes, it is the purest form of coconut oil, water white in color. What I really love about this is – It gets absorbed to skin real quick. Normal oils will be greasy on skin and take hours to get absorbed. Shesha Naturals Cold Processed Extra Virgin Coconut Oil is very very light weight and it instantly gets absorbed into skin. Shesha Naturals Cold Processed Extra VCO is an ideal moisturiser for the body, it leave your skin smooth and polished. Regular use prevents rashes and scaling of skin. make the body area more even toned. Mix organic sugar with few drops of our VCO and use it as a lip scrub to remove all dead skin cells and make your lips naturally soft, polished and plumped up. Excellent for haircare, Shesha Naturals VCO is a effective conditioning treatment for rough and dull looking hair. It soothes the dry sensitive skin or scalp and adds lustre to damaged hair. Take required quantity and apply to scalp and gently massage hair from root to tip. Leave for about 20 minutes, Wash your hair using a mild hair cleanser and luke warm water. It protects the skin from infections caused by bacteria, viruses and fungi, prevents dandruff and promotes hair growth if used regularly. VCO is widely consumed as MCT oil for weight loss treatment, etc. Before your regular work out, Drink a tbl spoon of our VCO. You can include this in your Veto Veg/Non Veg diet as well. Excellent for baby massages. Shesha Naturals Cold Processed Extra Virgin Coconut Oil is 100%, pure and Cold Processed (Absolutely NO heat) to retain its unique balance of nutrients. 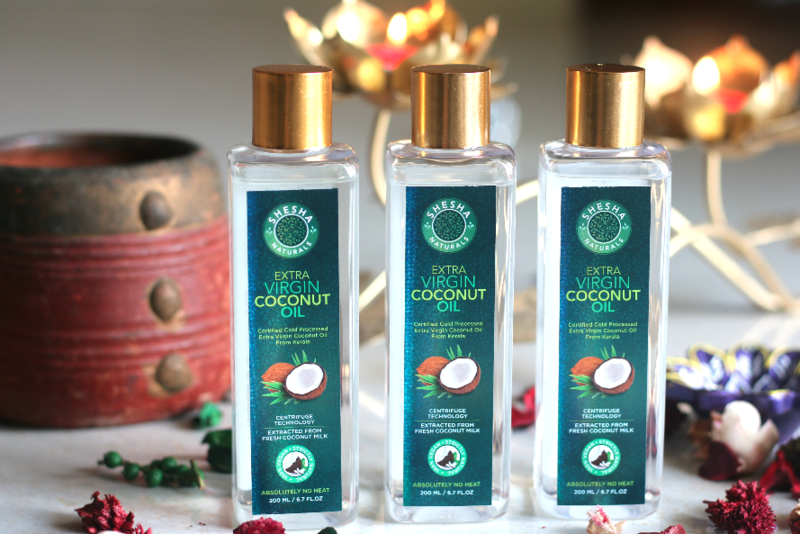 As its the most purest virgin coconut oil, It’s excellent for Baby massages, as a natural makeup remover, edible oil and also as a moisturiser for any skin types. There is nothing safer for baby’s skin than virgin coconut oil. It is completely pure and natural since it is made with coconut as the sole ingredient. Whether baby’s skin is dry or perfectly soft, coconut oil can be used to make sure it is always at its healthiest. A Safe, Gentle Oil For Skin Coconut oil has many benefits for baby’s skin. It contains lauric acid, a substance found in breast milk, as well as antioxidants and other nutrients. In addition to being completely safe and a great moisturizer for dry skin, it also nourishes skin to help heal diaper rash and other baby skin problems. This gentle oil is antimicrobial, anti-inflammatory, antibacterial and anti-fungal. This means it will protect cuts and scrapes from getting infected as well as heal them faster and fade any existing scars. Coconut oil works on baby’s skin because it helps skin cells mature and dead skin shed away. It creates the optimum environment for skin cells so that skin conditions are prevented and healed. The tropical oil is an effective treatment for cradle cap, a common infant skin problem that causes dry, flaky patches on the scalp. 100 % natural and chemical free. Virgin coconut oil works well for use in baby massage, a growing practice that can soothe cranky babies and improve everything from colic to digestive problems. Vastly superior to commercial massage oils, coconut oil has a naturally pleasing scent and texture. Shesha Naturals Cold Processed Extra VCO is extracted from fresh coconut milk without any chemical processes, it is the purest form of coconut oil, water white in color. ‘Absolutely No Heat’ involved in the process making it India’s best VCO. Excellent natural makeup remover. Take required quantity to your palms and warm it by rubbing both hands together. Massage it gently all over the face. Take a Wash Cloth and wipe off the oil off your face and wash off with a mild cleanser and pat dry. It takes off all makeup. • Virgin coconut oil (VCO) is abundant in vitamins, minerals and anti-oxidants, thus making it the ‘mother of all oils’. • Extracted from fresh coconut kernel without any chemical processes, it is the purest form of coconut oil, water white in colour. • Virgin coconut oil is a major source of Lauric Acid and Vitamin E.
• The virgin coconut oil is free from trans fatty acid, high in medium chain fats (MCFA) or medium chain triglycerides (MCTs) known as lauric acid, which is identical to special group of fats found in human breast milk. • VCO is widely consumed as MCT oil for weight loss treatment, etc. • MCT’s are more easily and rapidly digested than other types of fats, as they require lower amounts of enzymes and bile acids for intestinal absorption. • MCT’s are metabolized very quickly in the liver and are reported to encourage an increase in energy expenditure, while decreasing fat storage. • Numerous studies suggest that substituting MCT Oil for other fats in a healthy diet may therefore help to support healthy weight and body composition. • It protects the skin from infections caused by bacteria, viruses and fungi, prevents dandruff and hair loss. • Supplement your body with antioxidants. Antioxidant is your body’s natural defense against free radicals. • Rich in Vitamin C and Vitamin E, virgin coconut oil slows down the ageing process and assures the best of life and beauty to your skin. • It also helps in the absorption of fat soluble vitamins A, D, E and K.
• Virgin Coconut Oil is an ideal moisturiser for the body, it leave your skin smooth and polished. Regular use prevents rashes and scaling of skin. make the body area more even toned. • Excellent for haircare, VCO is a effective conditioning treatment for rough and dull looking hair. It soothes the dry sensitive skin or scalp and adds lustre to damaged hair. • Excellent for baby massages. Our Extra Virgin Coconut Oil comes in a easy to use packaging. It will be soon available in other packaging with higher quantities too. We are also launching wide mouth bottle as well. 01) All of the seed oils currently in the Indian diet are predominately made of triglycerides containing long chain fatty acids. These triglycerides, once ingested, need to be emulsified by bile salts. These salts are produced by the liver and stored in the gall bladder. When fats are ingested the bile salts are dumped out of or leave the gall bladder into the small intestine. Here they mix with the fats and draw them into the aqueous food solutions where lipase, one of the main digestive enzymes, can work on them. Since oils and water do not mix (as you would see in most salad dressings) the emulsification of the bile salts on the oils (fats) counteracts that natural separation. Lipase, the enzyme that breaks down fats, works in water or aqueous solutions and therefore the fats need to be pulled into the water. It is bile salts that do this. After emulsification, these fats become broken down into triglycerides made of 14-carbon chain fatty acids. Any carbohydrates eaten in excess of energy requirements are also converted into these 14- carbon chain triglycerides. They are bound to HDL and LDL in the bloodstream and then transported into storage. These triglycerides are then stored in fat deposits by the body until their energy is required. Coconut oil, on the other hand, is already smaller than the 14-carbon units the other fats are broken down into. So coconut oil is handled totally different by the body. Since coconut oil contains mostly 8-, 10-, and 12- carbon chain triglycerides, instead of being digested and traveling in the blood stream, it is directly absorbed into the portal vein and goes into the liver without requiring Lipase or bile salts for digestion. In the liver, these medium-chain triglycerides (MCTs) support the immune system and help to cleanse the body of pathogens, toxins, etc. These supportive actions continue on as the MCTs travel through the lymphatic system to the cells of the body. Coconut oil is not present in the blood stream and has never been shown to contribute to heart disease provided it is 100% pure (Centrifuge Extracted- ANH) and has not been heated, hydrogenated or pasteurized. People who are diabetic (insulin dependent), people who cannot digest food well or without gall-bladders, especially people who cannot digest fats (such as people with cystic fibrosis), and even cerebral palsy, will thrive on (Centrifuge Extracted-ANH) Coconut oil. It will bypass the pancreas and go directly to the liver, spine and brain with very high anti-bacterial, anti-fungal (Candida-Yeast Infections), anti-parasitic and anti-viral properties. Doctors doing research have known for a long time that the elderly, invalids and the very young thrive on formulas given them that contain coconut oil. Many products like baby food and formula used to be made with 100% Pure (Centrifuge Extracted-ANH) Coconut oil. Sadly, even these items have fallen victim to the chemical, petrol-chemical and pharmaceutical industries greed and propaganda over the last 60 years. 02) Secondly, as the medium chain fatty acids in coconut oil travel throughout the body they are actually anti-microbial compounds. For example, Lauric acid, which makes up about 60% of the coconut oil, becomes 2-mono-lauren. 2-mono-lauren dissolves the lipid envelope that protects most pathogenic bacteria and viruses helping to destroy them. It also attacks parasites and pathogenic yeast. Lauric acid contained in a human mother’s breast milk is the major reason nursing infants have a high resistance to disease and sickness (providing the mother is living healthy). Lauric acid from (Centrifuge Extracted-ANH) Coconut oil in your diet will have the same effect, regardless of your age. Coconut oil has been used in research with AIDS, Candida-Yeast Infections, Crohns disease, SARS, and many other diseases. People have been using its anti-microbial properties for thousands of years. 03) Thirdly, coconut oil, because it is smaller than the standard storage unit, is burned for energy rather than stored. One thing this tends to do in most people is increase their metabolism. People with under-active thyroid glands all of a sudden discover their basal temperature has become normal. People with low energy notice they have energy again and a sense of wellbeing they did not realize they had lost. Unlike other energy the cell receives, the medium chain fatty acids do not require insulin. Most people in the U.S. have some degree of insulin resistance. Most people as they age, even though they are eating, do not feel they are getting energy from their food. The reason for many people is insulin resistance. The good news is that if a person has coconut oil or coconut products in their diet, the fats will be used as energy and that energy is not dependent on the insulin system working. Therefore, diabetics can get good energy into their cells without insulin requirements, and people who need naps, or think they need naps in the middle of the afternoon, have energy again. Low Carb dieters, as well, can eat their low carbohydrate meals, but have the energy they would otherwise have received from carbohydrates. There are two main kinds of coconut oil: refined and unrefined. Refined oils possess no coconut flavor or aroma. They are produced from dried copra, not fresh coconuts, and the oil typically undergoes various levels of processing, including being deodorized and bleached. Unrefined coconut oil is normally considered virgin and it possesses a light coconut taste and aroma, that will vary from brand to brand. This mostly depends on the freshness of the coconut used and type of processing it was subjected to. An unrefined coconut oil is typically labeled “virgin” or “extra-virgin”. Each brand tends to have their own definition of these labels but in general both virgin and extra-virgin coconut oils are made from the first pressing of fresh, raw coconut without the addition of any chemicals. The term virgin has come to mean that the oil is generally unprocessed. For example, virgin coconut oil usually has not been bleached, deodorized, or refined. Virgin oil is typically made from fresh coconuts, but processing techniques will still vary in determining the product’s quality. Virgin oil usually has a coconut scent flavor and heats up to 350° F.
Whole kernel oil, which is made from the coconut kernel with the inside skin left on, is more nutritious and has a slightly nuttier flavor, whereas white kernel oil is made from coconuts whose brown inner skins have been removed and has a milder, more delicate aroma. Both oils have the same culinary and body care uses. Whole kernel is marginally more nutritious and has a slightly nuttier flavor. They’re both unrefined so they have the same smoke point. The nature of all oils is such that it involves processing; oils are not whole, and do not naturally exist by themselves in nature. Coconut oil is most commonly processed using expeller-pressed or cold-pressed methods. Expeller-pressed is a mechanical process that extracts oil from seeds and nuts, at high pressure and heat, and is usually used for refined oils. Cold-pressed coconut oils are pressed in a heat-controlled environment to keep temperatures below 49oC or 120oF degrees. Cold pressing does not designate what type of pressing machine is used. However, oil that has been cold pressed should not have been exposed to high heat before or after pressing. Cold Processed Centrifuged coconut oil is generally one of the purest and most expensive oils. During the centrifuge process, coconuts are shelled, crushed and ground into a slurry. First, the milk is extracted from the meat; then the remaining coconut is placed in a high-speed centrifuge that rapidly spins the contents. Through this spinning process, the oil is separated from the meat. Centrifuge coconut oil retains a strong coconut taste and smell and requires no further refining. Expeller-pressed and Cold-pressed don’t necessarily mean “raw.” Raw generally means that a food is not processed. People seek raw food because less processing means higher the nutrient content. As you can see above to obtain coconut oil it must be extracted in some way. Therefore, the term raw is loosely thrown around by brands but it most often indicates the oil has never been heated to a temperature higher than 96 degrees Fahrenheit. Temperatures above this point are known to destroy natural enzymes. It is better to store coconut oil in a cool and dry place. If your house is on the warmer side your coconut oil could melt to a liquid, but this is nothing to fear. The quality of coconut oil does not change as it phases between liquid and solids and back again. Just like how the less heat you expose to your food in cooking retains more nutritional benefits, in our VCO processing we believe in bringing to you the full benefits of Virgin Coconut Oil without any disintegration of the nutritional value. This quick process is necessary to prevent over-processing and to lock in the natural nutrients. It does not go through any fermentation stage, giving you the oil that is almost as natural as it is found in nature. There are no added additives, enzymes, bacteria or chemicals throughout the whole process. It is a tightly-timed process whereby only matured coconuts are plucked and within 24 hours are bottled to maintain its freshness. This allows us to retain the entire quality parameter of Virgin Coconut Oil and keeping all its curative properties. Unlike other processes extracting Virgin Coconut Oil, this is a 100% cold process method. Therefore, all micronutrients are retained at its highest potency, and none are lost to any form of heat. Grade 6 : Crude Coconut Oil (ffa max 5%). WHY is Absolutely No Heat Virgin Coconut Oil is expensive than Commercially available Cold Pressed Coconut oil? ANH-VCO with Centrifugal technology has best health benefits compared to commercially available Cold Pressed VCO. ANH-VCO with Centrifugal technology yields only 8-9% of VCO from 1 Kg of fresh coconut meat whereas Cold Pressed VCO yields 18-20% VCO. This makes Cold pressed virgin coconut oils are commercially cheap compared to Absolutely No Heat. Give it a try for yourself today and discover it for yourself! When it comes to health, don’t settle for second best. Order India’s Best Extra Virgin Coconut Oil today! Virgin coconut oil extracted by the cold compression method is considered better than that extracted by the fermentation method, since the oil extracted by fermentation has higher moisture content and goes rancid quicker. If you ever need to melt it (during winter, especially, when the VCO solidifies above 24 degrees), please do not put it directly on the heat. Instead, put it in a small cup and put the cup in warm water. I hope you all will try Shesha Naturals Extra Virgin Coconut Oil once. The Brand assures you the best in quality amongst everything that are available in India. Our Shesha Naturals Cold Processed Centrifuge extracted raw, unrefined, cold processed virgin coconut oil is perfect for consuming raw and for your skincare and haircare use. Coconut oil is really good. Thanks for providing all the details. This is sure a must have. Kudos to you too write it in Depth. This looks really amazing plus I like that you have kept the price point affordable to many . Congratulations for this launch Renji. Sending my best wishes for you and your brand. Such a nice detailed post, loving it! 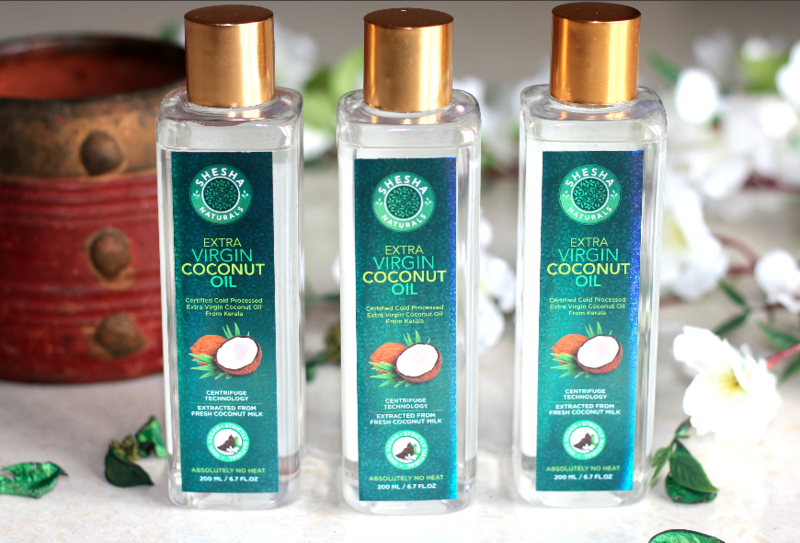 I love coconut oil – and really think this is the best ont he market! This is so informative post, thank you for introducing me to this brand. Everyone in my family loves coconut, one way or the other and I am always on the lookout for the good ones, will definitely check this. Wow.. Such a detailed post.. Got to know so much more about my favorite oil.. Congratulations Renji and all the very best.. I am ordering soon.. Coming from you, I have no doubts about its effectiveness.. Try Fractionated Coconut Oil. Best carrier oil. Doesnt blog pores. Affordable makeup remover. Great base oil for facial oils. cold pressed virgin coconut oil has endless benefits. Thanks for sharing Impressive information with us.